Everybody needs a break from time to time but when you are caring for a disabled child, the reality is that breaks can be hard to access. Here, Dorset based charity Diverse Abilities explains the importance of respite and how it can benefit the whole family. Here at Diverse Abilities, our Children’s Team understands the challenges that caring for a child with a disability can bring for the whole family. Founded by a local mum in 1955 whose daughter was born with cerebral palsy, we now provide a range of support services to children and young people with both physical disabilities and learning difficulties. 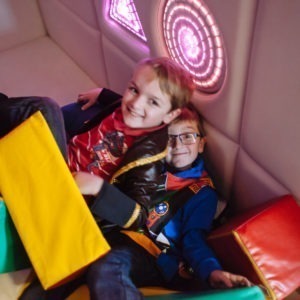 Our ethos is based on positivity, fun and laughter, through sensory sessions and fun activities, whilst parents, siblings and even grandparents enjoy some rest. We want to support families supporting extraordinary children to achieve their full potential. Our short break respite home, Lily’s Place, is registered with Ofsted and provides overnight and day respite for those aged 2-19 as well as transition days for young people and adults aged 18-25. Lily’s Place offers children and young people a safe and happy place to stay whilst giving parents and carers the opportunity to have a much-needed break. The service aims to help children and young people to develop a greater independence whilst encouraging social skills through interaction with their peers. Lily’s Place has incredible facilities, so individual needs can be accommodated for. We run a youth club every Wednesday called Awesome Nights for young people with additional needs aged 13-18. Our youth club is designed to help young people who may struggle to feel part of a wider community, or face a lack of opportunities due to their disabilities. Activities range from archery and ice-skating to pizza making and crafts. We have support staff on hand to help and support all young people so that they are able to take part as much as possible and more importantly, are able to make new friends and become part of a new social group. We offer a wide range of exciting activities during the school holidays for young people to attend. We also offer a weekend club for young people to socialise with peers in an inclusive, supported and safe environment. Activities may include visiting Chessington World of Adventures, Paulton’s Park, Abbotsbury Swannery, bowling, swimming, sensory workshops such as bubble making and yoga, crabbing, ringos, theatre trips and much more. We hold sessions for people with a disability and also sessions for parents and siblings to attend and get involved with. We provide domiciliary care for children and young people from birth to 19 years of age. We offer flexible support dependent on everybody’s needs. We take a keen interest in promoting independence whether that be in the family home or community based such as accessing leisure activities. Our specialist school provides a full sensory and therapeutic approach to meeting the needs of the pupils and helps them to achieve their full potential. The school also has nursing and therapy teams on site. • An advice team providing information on benefits, wills, lasting power of attorneys and more. If you would like to find out more about Diverse Abilities and how we can help you or a member of your family, please get in touch.